Air quality in the Reno-Tahoe area continues to remain poor with an index rating of 171 AKA “unhealthy”. Dense smoke advisories and limited visibility are expected to drop this afternoon. Outdoor activities and wilderness travel are highly discouraged during this time. For more information on South Lake Tahoe air quality, visit the Washoe County Air Quality Management. In lighter news, we are happy to report that the King Fire is now at 35% containment which is a 25% increase since this weekend and up from 18% yesterday. The cool and rainy weather has been a significant helping factor. To learn more about the King Fire efforts read more on the Reno Gazette Journal. To help out with the King Fire, visit Red Cross to make a donation! Today is a sad day for many in Lake Tahoe. The Lake Tahoe Iron Man scheduled for today, Sunday September 21st. Massive amounts of smoke caused event officials to cancel the event, just minutes before the race. Large mounts of smoke lingering in the air in South Lake Tahoe create unsafe conditions for athletes. The King Fire is still burning with 10% containment. More information on the King Fire. Highway 50 remains closed this morning as the “King Fire” in Pollock Pines continues to burn. Smoke continues to drift into the Lake Tahoe area from South Lake Tahoe to Truckee. For more information read more here. New Home: Black Bear’s Gem – Christmas Valley Beauty-Walk to River, Fun for Adults, Kids, and Dogs! Beautiful, clean home perfect for 2 families. This home is a great spot to get away from it all. Newly constructed, it is well designed with downstairs game room and pool table, and 2 large bedrooms each with queen-sized bed. There is a full bathroom downstairs with shower. Also downstairs is the large matching washer/dryer, and the coolest little doggie shower, so even your pup can have a spa day. Upstairs on the main level is a beautiful carpeted living room, with a rock fireplace as the centerpiece. The large leather couch and chairs face the fireplace. The dining area and kitchen are open to the living room, which makes it great for the cook, who can still participate in the conversation. The fireplace has a gas insert, great for ambiance at the push of a button, and also works to heat the living space. The large kitchen has stainless appliances, granite counter tops, and wooden cabinets. There are bar stools for chatting with the cook or dining at the counter. The dining table seats 6, with 4 chairs and a bench. There is also a high chair for the little one. The spiral staircase starts in the living room, and ends at the loft upstairs, which the kids just love! There are 2 twin bunk beds, and a full bed for the older siblings or lucky parents that will be keeping an eye on the kids. Down the hallway from the kitchen is the half-bath, and the master bedroom. This large room with king bed has the perfect view of Echo Peak from the large picture window. It is fantastic in both winter and summer. The master bath has a separate Jacuzzi tub, and step-in shower. Also in the room is a futon, for a little extra family sleeping space. Outside the back door is a nicely landscaped back yard, with patio, grass, and a built-in charcoal BBQ-the type that you will find in a park. Christmas Valley is located at highway 50 where 89 heads south to Kirkwood ski resort, near Meyers and Tahoe Paradise. In the winter, this is great location for easiest access to all 3 ski resorts: 35 minutes to Kirkwood, 18 minutes to Sierra at Tahoe, or 18 minutes to Heavenly. But if you cross-country ski or enjoy snow shoeing, you can do that right out your front door, on trails that are for public access on Forest Service land. In the summer, the best part is the walk down to the South Upper Truckee River, which is literally out your front door. A short walk across the street and along the Forest Service path, and you are at the perfect, secret swimming hole, with shallow slow moving water, a small sandy beach and a few lovley boulders. Even the little ones can play at this shallow spot on the river. Bring a picnic lunch and spend the day! Outdoors, there are paths to walk the dog, ride your bike, or just meander through the woods along the river. As you venture further from the home, there is easy access to hiking and mountain biking, river rafting and golf. The Tahoe to Yosemite Trail (TYT) and Pacific Crest Trails (PCT) are accessible from the area and are the main Tahoe trailheads for backpacking south to Mount Whitney. The South Upper Truckee Road Trailhead is located at the end of the South Upper Truckee Road in Meyers. It is a paved road to the trailhead and is maintained year-round. For a beautiful, and easy hike, the Washoe Meadows State Park is a 5 mile drive. The unofficial hub of mountain bike activity in South Shore is nearby. This area has a high density of trails for all ability levels, and will keep almost anyone interested for hours. During the summer, depending on the water level, there is rafting on the South Upper Truckee river. Fishing season for the Lake Tahoe tributaries is July 1-September 30. For golfers, there are two golf courses within a short distance: Tahoe Paradise golf course is 1.2 miles from the home, and the Lake Tahoe Golf Course is 2.1 miles. We hate to brag, but South Lake Tahoe, in our opinion is home to some of the most beautiful sunsets in Northern California. All we can say is #nofilter! The beauty of Lake Tahoe speaks for itself and you can see it right here in our pictures from the lake last week. We’d love to see some of your sunset photos from South Lake Tahoe! Feel free to share your gorgeous views with us on our Facebook Page. Remember you too can get these amazing views when you book your next stay with RnR Vacation rentals! Labor day officially marks the end of summer, but that doesn’t mean that the fun has to stop! 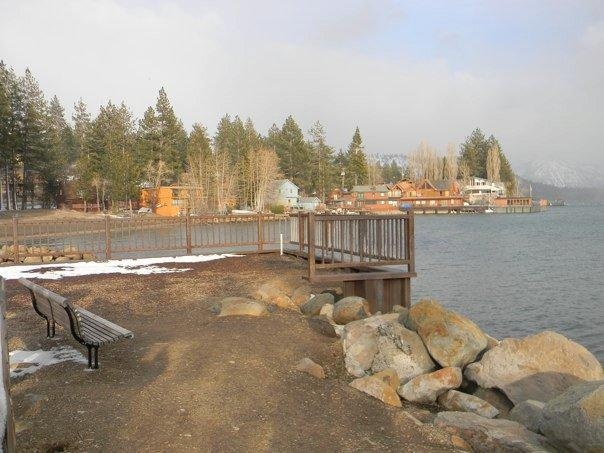 South Lake Tahoe still has many activities for the whole family. From concerts to marathons there seems to be endless reasons for adventurers and wanderers to head up to the mountains as fall begins to set in. Arguably the most beautiful marathon in the world, the Lake Tahoe Marathon has grown into a premier, 3-day running festival, attracting thousands of athletes and visitors each year. Masters of Illusion, Believe the Impossible! The Tahoe Bike Classic is September 27 & 28, 2014 with a 36 and 72 mile Gran Fondo, and Hill Climb Time Trial in South Lake Tahoe!